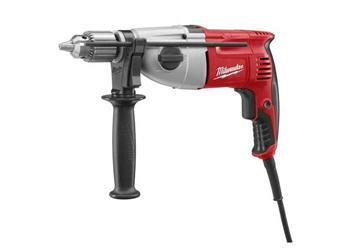 At 7.5 amps this heavy duty pistol grip Hammer-Drill can handle the toughest drilling of 1/2 inch holes in concrete. With dual range speed control, the operator can choose more power to speed for the toughest applications or more speed and less torque for lighter applications. Equipped with a removable side handle, the side handle also assists in setting the depth rod for pre-set hole drilling. Use for drilling in wood, with Flat Boring Bits, Hole Saws, Auger Bits, and Selfeed Bits. It can also be used to drill in steel with Twist Bits and in concrete with Percussion Bits. Selfeed Bit Capacity 1-3/4 in.